We are planning on adding new options into our Phone App. Here are some ideas that we’ve been kicking around. Or in English-speaking countries, regulator: A watch with hours, minutes and seconds on separate dials, or subdials. It has the look of a chronograph, and the advantage over conventional analog watches in that the time can be read without hands interfering with each other. No hand obstructs the time-telling of another. In the past, doctors favored the regulator when they made house calls, to measure a patient’s pulse. Also, because of its alleged accuracy, the regulator was once used as the primary “marine chronometer,” in observatories, and as a reference instrument in watchmakers’ workshops for regulating the watches they were building. Today, with LED and LCD displays, and the accuracy of quartz, the regulator has become somewhat of an anachronism. However, it maintains a nostalgic appeal, dating back to the late 1700s and its inventor, Pierre Louie Berthoud. 2. The color combinations may require the use of sunglasses…indoors! At Whacky Whatch App, our intention is to dazzle the senses as well as exercise the mind! Intentionally, the subdials do not have hour or minute markers, which makes time-telling more challenging and, we believe, more fun. But there is always a “Help” screen at Whacky Whatch App, if you feel the need. The time, as shown, is: 2:29:40….more or less!! I love this one!! I call it the QuatroRetro (for four retrogrades). I have always admired the action of a vintage retrograde movement, and have attempted to unite this feature with a contemporary look—a bit of pizazz! 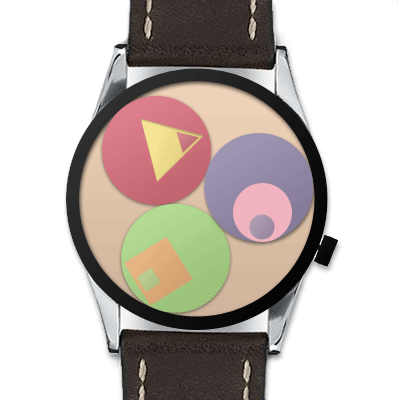 The result is a very colorful app image, with a unique way to tell time. As with the Regulateur, it dazzles as it challenges! 1. The top quarter (maroon) represents hours, and is calibrated from 1 to 12. At the beginning of each successive hour, the hour hand will jump clockwise to the next number. 2. The left-side quarter (pink) represents minutes, in increments of 5, from 0 to 55. As with hours, the minute hand will jump clcokwise at each 5-minute increment. 3. 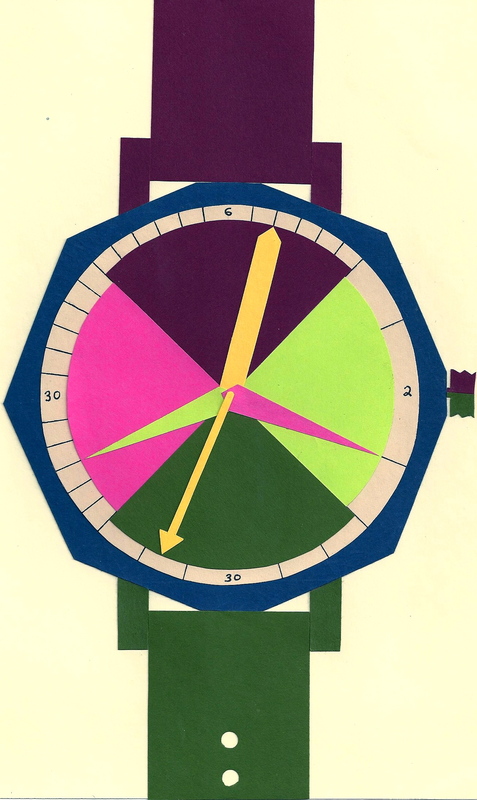 The right-side quarter (light-green) represents minutes, from 0 to 4. These minutes are added to the minutes noted in #2. (See Ex. below.) The hand movement is also clockwise. 4. The bottom quarter (dark-green) represents seconds, calibrated in increments of 10, from 0 to 60. In the time-telling mode at Whacky Whatch App, unlike the other hands, the forward (clockwise) and retrograde (counterclockwise) motion of this hand is easily visible, and fun to follow.